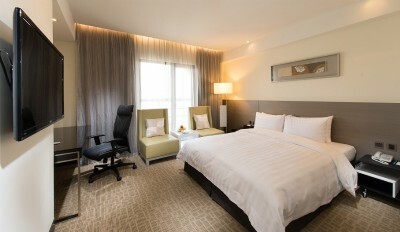 Forte Hotel is located at the center Of Changhua County. Nearby the hotel, there are famous touring sites for you to explore such as Bagua Mountain Great Buddha, Nanyao Temple Cultural Hall, Changhua Art Museum, Hongmao Well, etc. It is a relaxing weekend escape you may consider to plan. TWD 1100 for additional guest with extra bed. Charge to be paid upon check-in. Breakfast included. Toiletries & Beddings included.